You see, we use hot water several times in the day: in the morning for my son's oatmeal and also several other times for the tea I drink (especially when I was pregnant!). We were using an old tea kettle on the stove to heat water and it TOOK FOREVER! I knew there had to be a quicker alternative to heating water and I was so excited to meet the H2O PRO! We had very high expectations for it and it met every single one! It has so many amazing features that we love: it is faster, safer and more energy efficient than our old stovetop kettle. Its ease of use and precise digital temperature control, combined with its beautiful stainless steel design, make the H2O PRO the top choice for anyone who needs hot water but doesn't like what microwaves do to food and water and doesn't have time for slow stovetop kettles. I love the nice big size - 56 oz! It bigger than our old stovetop kettle but yet still heats faster - I LOVE THAT! The stainless steel matches perfectly in our black and silver themed kitchen and with our other stainless steel appliances! I love the variable temperature control with 11 settings from 110°F to 212°F and what sets it apart is that you can program it to keep the water warm from 110°F to 190°F for up to 40 minutes! You can also set it to reduce chlorine and extend boil settings to purify water taste! The Water Level Window is great to see clearly and quickly how much water is in the kettle - unlike with a stovetop kettle where you have to lift the lid every time to see! This kettle is seriously FAST - it boils the water in under 5 minutes and it is a nice quiet boil! Sometimes, I wish it did have a signal or beep of some kind to let me know it was done because sometimes it goes so fast, I didn't even know it boiled! But times when my daughter is sleeping, I am so happy for the quiet boil! The kettle can also be placed directly on the table or counter without using a heating plate for easy serving! I love how there is not kettle on my stove anymore taking up room I need for cooking! This kettle takes up minimal room and it fits perfectly on our side table! If you drink a lot of teas, then the Capresso H2O PRO Water Kettle is made especially for YOU! To extract the best flavor it is necessary to steep tea leaves at the correct water temperature and for the right amount of time. A stovetop kettle cannot be programmed for specific temperatures and is only handy for reaching the boiling point, but the Capresso H2O PRO features 11 temperature settings from 110°F to 212°F. Plus you can program precise water temperature for a variety of teas from white and green to oolong, black, herbal and rooibos. 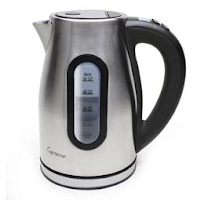 This Capresso H20 PRO Water Kettle has changed our daily lives and made everything get done SO MUCH QUICKER! I am so grateful for such an amazing invention and I know you will love it too! Buy It: You can purchase the Capresso H2O Pro Water Kettle for $79.99 on the Capresso website.